In November 2011, Eric Boocock from Microsoft announced a change to SharePoint Online (Office 365). 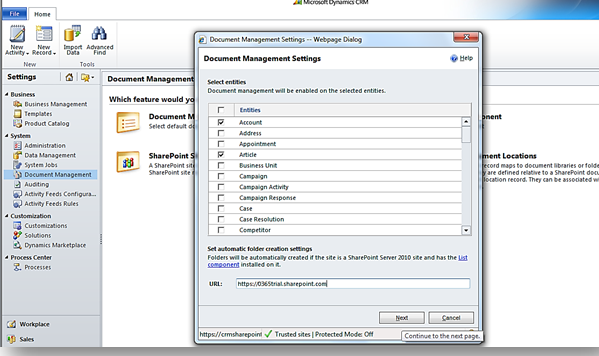 The change included the ability to enable document management using the SharePoint List Component with CRM Online. Since I’ve been waiting for this feature for several months, I decided to give it a try. The first thing I did was to clear a 4 hour block of time from my schedule to implement the solution. I was aware that several articles list a few clicks here and a few clicks there, a tweak here and a tweak there and you’re done. I also understand that one person’s experience with a new feature can vary from another’s so I decided to allow ample time to deal with any unexpected issues. The key article I used to understand the steps required to implement the solution is one written by the Microsoft Premier Field Engineers; CRM Online Document Management with SharePoint Online (Office 365). If you don’t already follow this blog, I encourage you to consider adding it to your list. The articles are packed full of great advice, helpful hints, issue resolution and more. CRM Online, you can obtain a trial account if you don’t have an account. Office 365, you can obtain a trial account if you don’t have one. You’ll have two choices with the Office 365 account; Small Business (P1) or Midsize / Enterprise (E3). 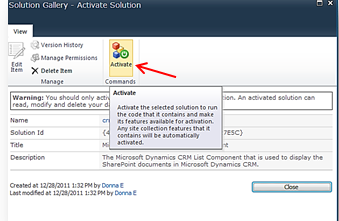 Ensure you select the E3 type as P1 does not have CRM Online integration capability. Once you’ve completed the sign up and activation steps, you are ready to begin the integration. 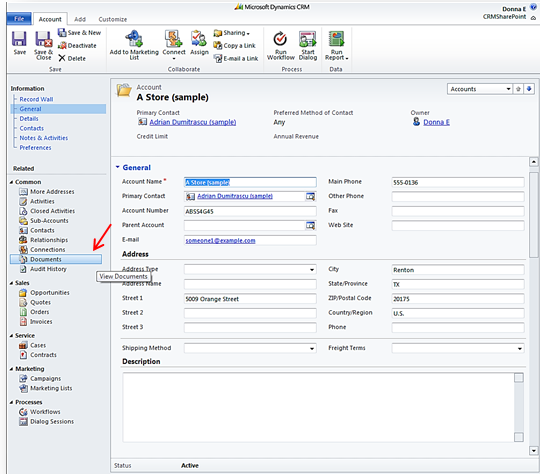 The first step in the process is to download and save the Microsoft Dynamics CRM 2011 List Component for Microsoft SharePoint Server 2010 to a folder on your hard drive. I created a folder for the list component so it would be easy to find when I needed it. 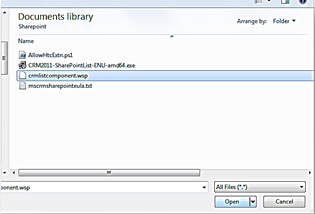 The list component will download as an exe file which you can select to run after the download is complete. Run the exe and accept the license terms when the screen appears. When you select the Continue button you will be prompted to save the extracted files to a folder. I selected the same folder where I saved the original download. You should be able to see the list component file in the directory when the extraction is complete. Select the Upload button and browse out to the list component file. Select the list component file and select the Open button from the lower right. 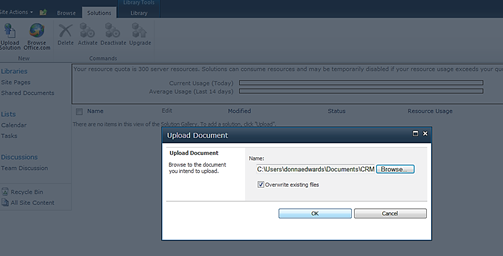 Leave the Overwrite existing file checkbox and select Ok. 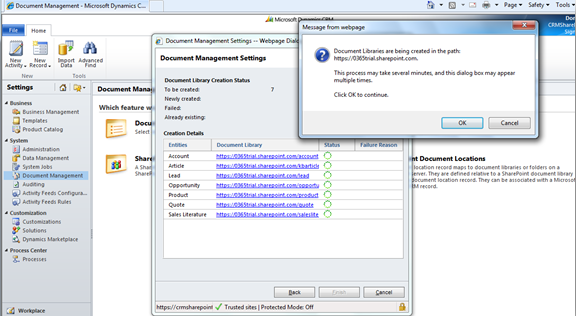 Copy your SharePoint URL to notepad or some other document and save it for the next step. At this point you are ready to configure CRM Online to use SharePoint Online as the document repository. It’s now time to login into CRM Online. You can now select the entities that you want to allow for document management or leave the default selections. You should also copy the SharePoint URL into the URL field. 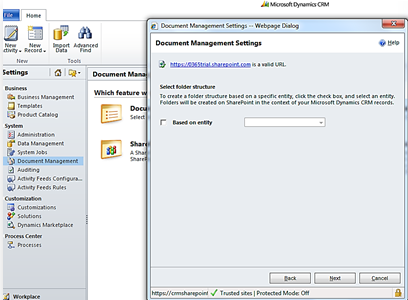 Select Next and CRM Online will validate the settings to ensure that the SharePoint URL is valid and available. If CRM Online is not able to validate the URL, you will receive a message asking you to valid the site or correct the entry. 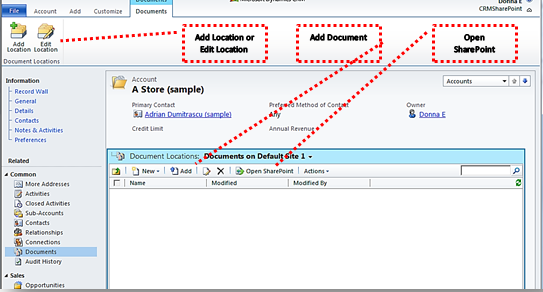 If you leave the default settings, the folder structure will default to a simple approach; Entity, Record Name, Documents. 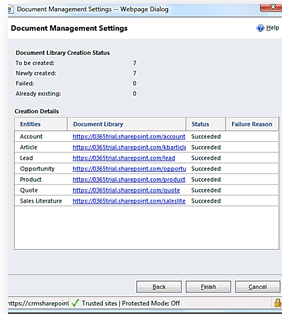 If you select the Based on entity checkbox, the folder structure will be more complex and locating documents from the SharePoint repository could prove more challenging for the end user. I recommend keeping the structure simple but you’ll need to decide which is best for your implementation. Once completed you will receive a status message. If all entities completed successfully you can select the Finish button. If not, select back and resolve issues as needed. Next, go to one of the entities that you selected for document management and open an existing record or create a new record as needed. For this example, I opened an Account record and selected documents from the left navigation menu. 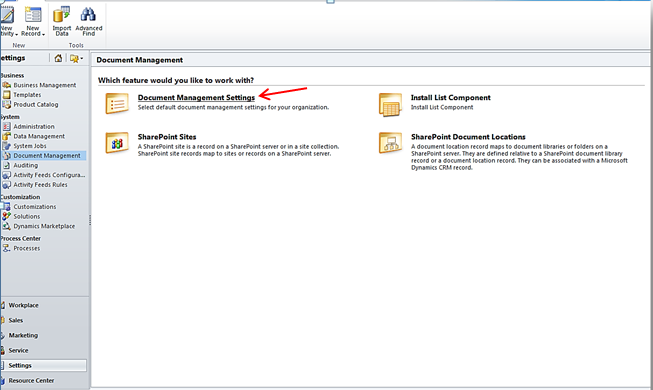 The first time you select Documents from an Entity, you will receive a notification that the folder will be created in the SharePoint site. Once the initial folder is created you will be able to add a new document or take a different action. At this point you are done with the steps required to integrate the systems. It is now time to get familiar with the new feature. Adding new folders, changing document locations, uploading new documents are just a few of the actions available. I encourage you to explore the various options to gain a comfort level with each. 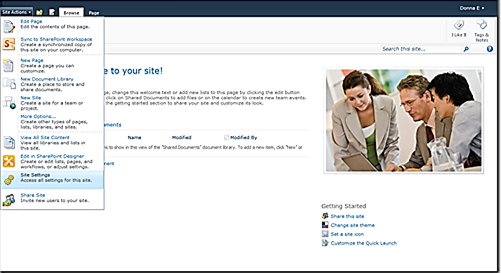 As you will discover, it is very easy to open SharePoint from CRM Online and go back and forth between applications. Although I cleared my calendar for 4 hours to ensure I had enough time to implement and troubleshoot the solution, it took less than 30 minutes to complete. It actually took me four times longer to write this article than it took to integrate CRM Online with SharePoint online. Well done, Microsoft, this is about as easy as it gets. Great detail. thanks for taking the time to share your Sharepoint and CRM Online integration experience. You’re welcome, glad you liked the post. Very informative. However when I go to put into site setting under galleries there is no solutions link. Why is this? How do I get it to come up. You’ll need to ensure that you’ve selected the correct plan. You’ll need the Enterprise plan in order to integrate SharePoint with CRM. We are evaluating using Dynamics CRM online and integrate with our website. We are then hoping Dynamics can authenticate a member with username and password, then show a list of private “member only” documents. I am finding it difficult to locate such information on how to integrate with a webpage. Would your solution above work to show on a webpage (maybe within an IFrame or something similar)? I think you’ll either need to leverage the SDK to build a custom application that can provide the interface or consider using the Customer Portal that you can find on the Dynamics Marketplace or the ADX portal. Either of those solutions will give you what you need. At my work we need to have this for a project. 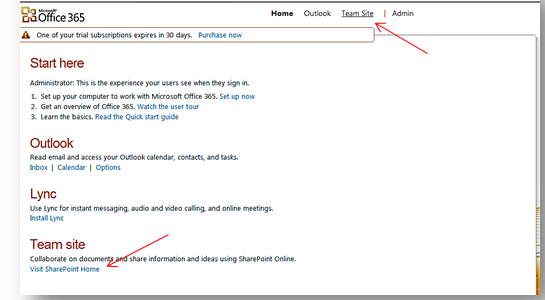 The only difference is that we don’t want to show the button ‘open sharepoint’. Can anyone help me on this subject? Today I followed these steps and created a SharePoint Document repository for a demo that we plan to do in a couple of weeks. It is good to know these steps still produce the desired result. It’s a great article. Really helpful. However, I am stuck in the Document management settings of CRM. 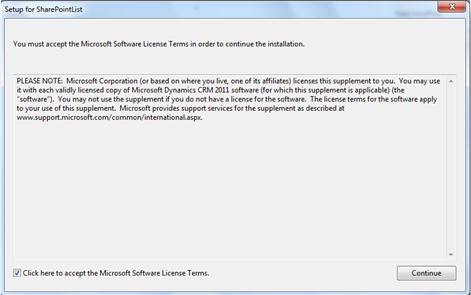 It keeps on saying that “CRM List Component” is not installed. But i have installed it. 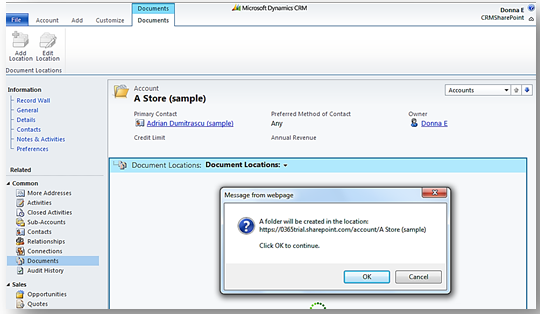 I am using Sharepoint Online and CRM Online for the same as described in your article. Which Plan did you select for SharePoint Online (Office 365)? Did you select the E3 plan?